A letter intended to reach Sen. Roger Wicker, R-Miss., was intercepted at an off-site facility after testing positive for a deadly poison, FBI officials said late Tuesday. 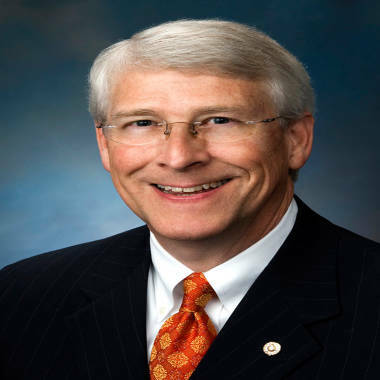 Republican Sen. Roger Wicker of Mississippi was sent a letter that tested positive for the poison ricin. An initial test of the mail, which was caught during an off-site postal screening process in Landover, Maryland, detected the letters contained the poison ricin, according to officials. A second test conducted in a lab also came back positive for the poison. The envelope never made it to Wicker's office. No one at the off-site facility was exposed to the substance, according to sources familiar with the mailing. "I want to thank our law enforcement officials for their hard work and diligence in keeping those of us who work in the Capitol complex safe," Wicker said in a statement Tuesday night. He did not say anything about the letter, only that, "This matter is part of an ongoing investigation." Senators were made aware of the incident during a briefing Tuesday evening regarding the attack at the Boston marathon. Sen. Claire McCaskill, D-Mo., told NBC News the individual who sent the letter is known to send correspondence to elected officials. Authorities have identified a suspect who "writes to a lot of members," McCaskill said. The FBI and United States Capitol Police are both investigating the mailing which was postmarked from Memphis, Tennessee and had no return address. Members of Congress have directed their staffs to be on alert. Ricin is a potentially deadly poison found naturally in castor beans, according to the Centers for Disease Control and Prevention. It can affect people who inhale, ingest or touch the substance, causing symptoms that include fever, cough, heavy sweating and excess fluid in the lungs. Death from ricin poisoning can occur within 36 to 72 hours of exposure to the substance, the CDC says. There is no antidote for the poison. Victims can be treated by removing the source of the ricin, and in, serious cases, with breathing aid, IV fluids, activated charcoal and medications used to treat seizures and low blood pressure, according to the CDC. Mail to the Senate has been suspended, likely until the end of the week, officials said. The off-site screening facility used to review all mail sent to Congress is temporarily shut down while a search is underway for the possibility of any other letters. They are reviewing mail postmarked from Memphis. "That's why we have the off-site screening facility for mail," said McCaskill. "And the tests came back positive. And they are shutting down the post offices temporarily to make sure they get everything squared away and we are notifying our state offices what to look for." She added, "The bottom line is, the process we have in place worked."